Storms and Rain, praise Adonai! Thunder and Lightning, extol the glory of God! The melody of each verse is repeated in the following verse. 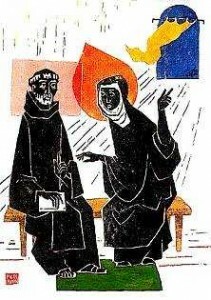 Now to heaven’s greatest height, Noonday rest and blessed light,Fair Scholastica ascends. Now the winter’s cold is past, Rise, my love, and come at last, Be at rest my face to see. She has run the Gospel way, And within her virgin soul, Love’s fulfillment she has found. God upholds the promise now And she wears the crown of life, All her hope was not in vain. Benedict beholds her flight And he sees his sister’s soul In the glory of the saints. Like twin stars they glisten bright; May they guide us all alike In the Rule that leads to life. Savior may we hear your call From the pleasures of the world: Come and love me more than these. Set your seal upon our hearts, May we give our lives for you, All our loss to count as gain. Jesus, Lord and virgin’s crown, With Scholastica we sing Blessed be your name today. Glory to your holy Name: Abba, Word and Holy Breath: Now and for eternity. Amen. “Behold, the bridegroom comes, go to meet him.” Alleluia! There is nothing more I need. You renew my drooping spirit. Always true to your Loving-kindness. To strengthen, guide and give comfort. My cup is more than full. Whatever gains I had, these I have come to consider a loss because of Christ. More than that, I even consider everything as a loss because of the supreme good of knowing Christ Jesus my Lord. For his sake I have accepted the loss of all things and I consider them so much rubbish, that I may gain Christ and be found in him, not having any righteousness of my own based on the law but that which comes through faith in Christ,the righteousness from God, depending on faith to know him and the power of his resurrection and [the] sharing of his sufferings by being conformed to his death if somehow I may attain the resurrection from the dead. and I shall live, and do not confound me in my expectations. V. I bind myself to do your will, do not disappoint me. V. I will run the way of your commands, you give freedom to my heart. V. Glory to the Abba and the Word, and the Breath of Love. Those who were prepared went into the wedding, Alleluia! and build up communities of service committed to work and prayer with women and the poor: ~free us to use our gifts and talents as ministers of the Good News wherever you lead us. ~ may our hearts be ready to love and pray at every moment of the day. On this day when so many are weary of the cold and snow of winter, ~ kindle our hope for the arrival of Spring and give us the grace to encourage all whom we meet today. Holy One and God of endless Compassion, you are the praise of all your saints and the joy of all creation. We rejoice today in the fellowship of your blessed servant Scholastica and we give you thanks for her life of devoted service and her legends which continue to delight and inspire us. Fill us with life and light, and give us perseverance to serve you all our days; For yours is the power and glory of love now and forever. Amen. and may he bring us all to everlasting life. ~Amen.